We offer comprehensive financial planning designed to help you manage your resources so that you are able to fund multiple goals, ranging from retirement savings and investing to education funding. The financial plan that we develop together will serve as the foundation for the advice we give and it will model various life and financial scenarios. The plan will provide you a roadmap for all areas of your financial life including savings, investments and retirement plans. But as with life – things change and the plan will be updated on a periodic basis to review the affects of these changes. Successful investing is not a sprint, it's a marathon. Our philosophy on investing is that it is a long-term commitment that requires careful thought, patience, and determination. Wealth is best accumulated and preserved by the constant application of the basic principles over a period of years, and not by emotional responses to day-to-day or month-to-month market fluctuations. We will work with you to create a portfolio strategy plan that is designed to help you achieve your goals within a comfortable level of risk. 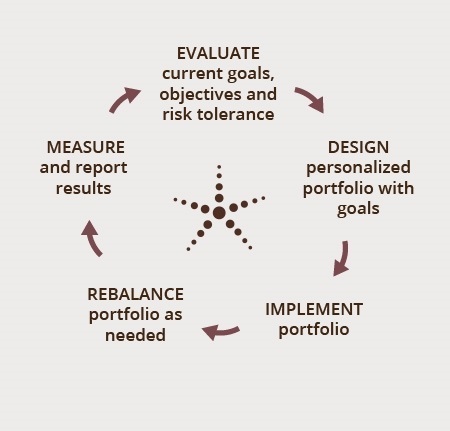 We believe the best way to help meet our client’s goals is by using the below investment management process. Arranging your finances so you can retire when you want, with the lifestyle you want takes significant planning. While in retirement we will help you position your portfolio for income and achieving maximum tax efficiencies while determining optimal cash flow strategies. What assets are required to maintain your current and future lifestyle? Are you saving enough for the retirement lifestyle you’re looking forward to? Can you retire when you wish? Are you really ready to stop working full-time? How much money do you need in retirement to accomplish your goals? Are you saving enough to meet your retirement planning goals? After retiring, you may need help in determining how much to spend and which accounts to spend down first. In our plan, we will include a sustainable withdrawal schedule that can put you on the path to enjoying your retirement. We will review your existing estate documents, or work with you to get new documents drafted. We can help ensure that you are able to provide for your heirs and favorite charities and make it easier for them to sort out your finances after you’re gone, as well as to reduce amounts subject to federal/ state estate taxes and implement the correct legal structures to efficiently distribute your assets. We will coordinate with other advisors including CPAs, attorneys, and other financial professionals. How much should you start saving? Which education saving options are the best for your situation? Decisions you make today can have long-lasting effects, so we take the time to help you clearly define your goals and explore different charitable giving options. As you plan your charitable giving, we help you consider your personal objectives outside of philanthropy. You might want an income stream during your lifetime, or you plan to support the needs of your loved ones. You may also want to confirm that you have a strategy in place to help minimize estate and income taxes. To accomplish your objectives, we work with you to develop a giving approach that best fits within your overall financial plan. We can then help you determine the timing of your gifts. A donor-advised fund is a program of a public charity that allows donors to make contributions to the charity, become eligible to take an immediate tax deduction, and then make recommendations for distributing the funds to qualified nonprofit organizations on your own timetable. A Charitable Gift Annuity is a contract under which a charity, in return for a transfer of cash, marketable securities or other assets, agrees to pay a fixed amount of money (payment) to one or two individuals (beneficiaries or annuitants), for their lifetime. This type of trust allows the donor or another individual to retain an income during their lifetime or for a set term. At the end of the term, the remainder typically passes — without taxes — to the charity.